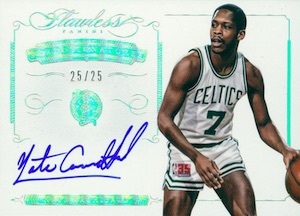 A key part of the ever-growing stable of high-end NBA releases, 2014-15 Panini Flawless Basketball returns to the fold with on-card autographs and base cards embedded with gems. 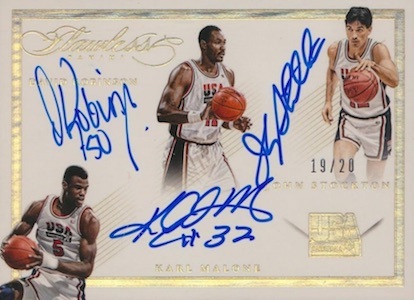 Each ultra premium box contains six autographs, two jewel base cards and two memorabilia cards. 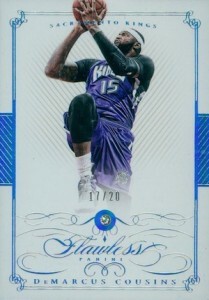 Although calling it a base set seems to be a huge understatement, all base cards in the product feature a small jewel and a print run of 20 copies or less. 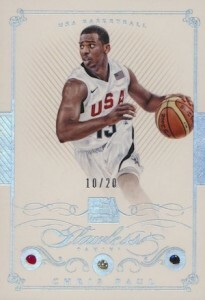 In addition to the veterans, rookies and former greats of the NBA, USA Basketball is a new feature of the base set with a focus on top names in the history of the men's program. 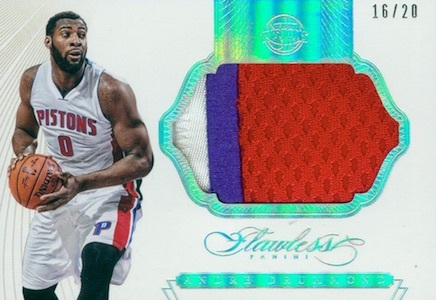 Each subset card contains three gems, including a ruby, diamond and sapphire, to signify the iconic red, white and blue. 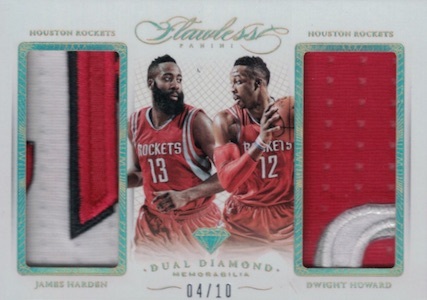 A new feature of the set, Dual Diamond Memorabilia includes game-worn patches for two players on each card. There are also Dual Logoman parallels. 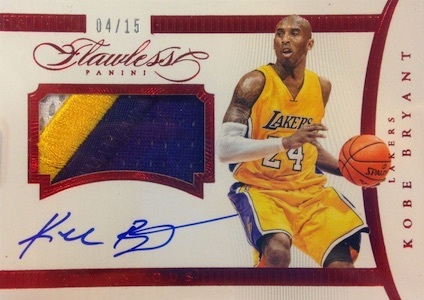 All cards in 2014-15 Panini Flawless Basketball are numbered to 25 or less. 50 cards. 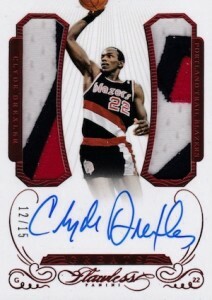 Serial numbered #/20. 27 cards. 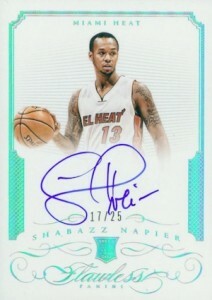 Serial numbered #/15. 69 cards. 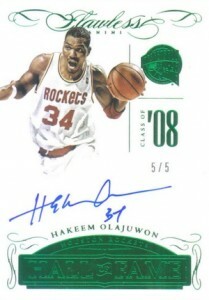 Serial numbered #/15. 44 cards. 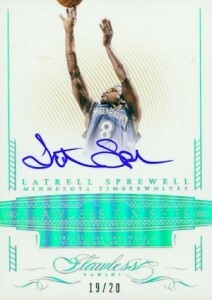 Serial numbered #/20. 20 cards. Not all print runs were provided. 28 cards. 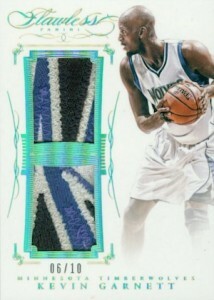 Serial numbered #/20. 81 cards. 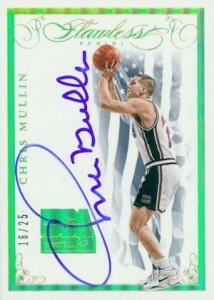 Serial numbered #/25. There are three versions for each player. 27 cards. 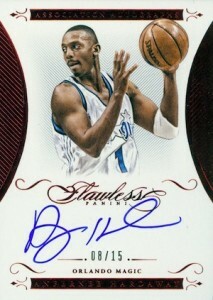 Serial numbered #/20. 91 cards. 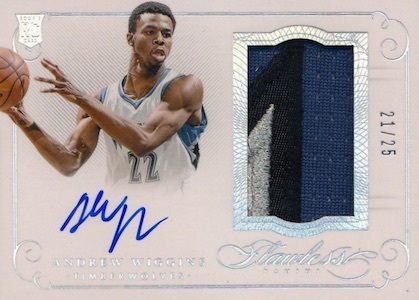 Serial numbered #/10.